Arrived at 6.20 am and bus to Fira is waiting just outside (Don't know it's a coincidence or a scheduled for the flight). The staff of security check kept using his mobile and not looking at his screen. Departure waiting area was very crowded. 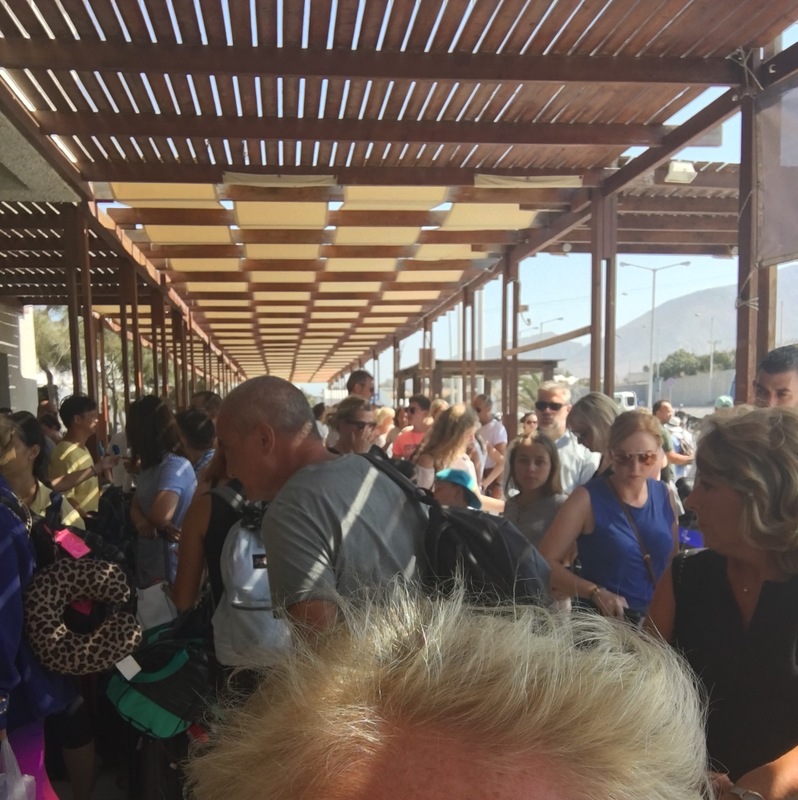 Travelled through Santorini Airport on 15th August to go to London Gatwick with EasyJet. It was like travelling in a developing country! Utter chaos. We arrived at the recommended two hours prior to departure only to find that we couldn't drop our bags as the flight wasn't yet open. The female staff were rude and clearly not well versed in customer service. Airport felt dirty especially the loos. 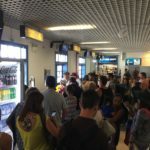 As we were travelling with two young children we expected to be called to board the plane after speedy boarders but were not. A not very pleasant end to an amazing holiday on the island. Last impression of Santorini was not great thanks to the airport. Such a shame. I recently had the misfortune to pass through this airport and what every other reviewer has said is true this has to be the worst airport in Europe and possibly the world. 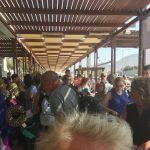 Santorini is a beautiful island with some of the most beautiful views but I wouldn't go back there purely because the airport is such a shambles it spoils your holiday. There are very little facilities the toilets are disgusting I stood in a departure hall which was packed with people filling 2 flights its hot sweaty and chaotic. 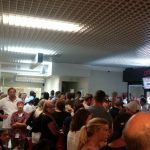 We were lucky enough to visit the airport when it wasn't overly crowded but it was still a terrible experience. Small hot and very very smelly (the toilets are gross and are nearby everywhere you would sit because it'd so small). The upstairs area was much better but filled with smokers. If you can tolerate smoke I advise you to wait upstairs for your flight as it's much nicer. Still all of this would be OK and I would have forgiven it all (after all you are on a small island) but the security process was awful. There was one guy running the security line. He looked about 20 years old and was texting on his phone the whole time as people shoved their bags through and walked through the X-ray machine. He was not paying attention not to the bags going through the machine nor to the people walking through. Absolute chaos. This airport would seem to have had no investment for years and is clearly totally inadequate to deal with the number of passengers passing through it at peak times. Queues at the check in desks (if are even able to locate the right desk the television screens when we were there only showed the desks to go to for flights that had already left) crisscross with queues for putting your own checked-in hold luggage through X-ray and security screening (which appears alarmingly laid back). Once airside you must keep your wits about you and remember to join another long queue snaking though the hopelessly congested seating area to go through passport control. If you have the nerve delay going through here till the last moment as there are absolutely no facilities on the other side. In all airside "boasts" a cafe upstairs with outdoor seating and shabby strained toilet facilities. There is a shop downstairs but even if I'd wanted to look round it it was unreachable due to the masses of people. 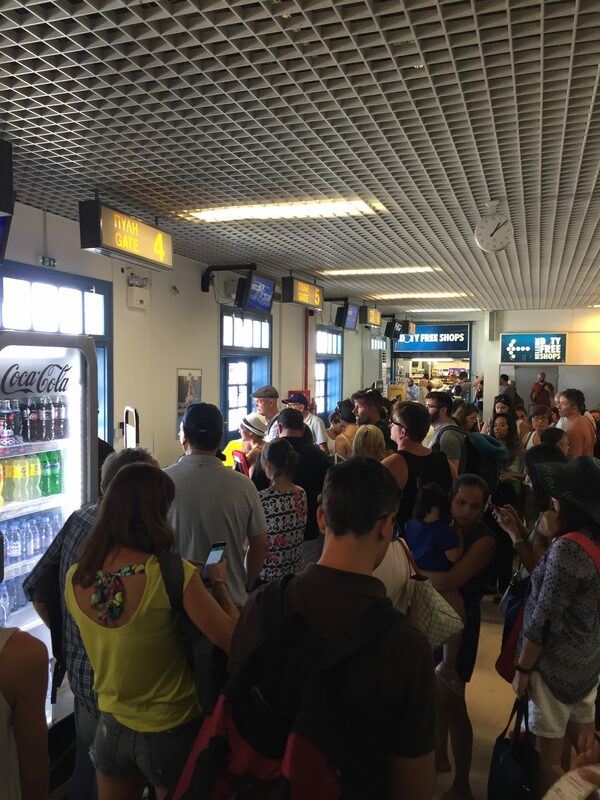 In summary an airport understaffed and in dire need of modernisation. I have travelled through third world airports which put this to shame. It is hard to credit that this an International Airport in a European country. Misery leaving by Easyjet. Queuing queuing and more queuing. Had to sit outside for 1.5 hours. Coach after coach load of Thomas Cook customers. No announcements. No update on the board. Masses of people. Overpriced food and drink Really overpriced. Duty free very small. If you have to go there take your own food. Misery leaving by Easyjet. Queuing queuing and more queuing. Nowhere to sit. No announcements. No update on the board. Masses of people crammed into one small room for an hour or two then moved on to another small room to wait there standing for another hour. I will never complain about Gatwick or Stansted again. Arrived at Santorini airport 3 hours before departure after being told about the terrible system they had in place and even then after booking in going through security and passport control we had to go straight to the gate to board the plane - no time for shopping refreshments or even to go to the toilet! The staff were officious rude and completely inept! If the plane had left at the time it should have it would have been empty. A lovely holiday spoiled by the last memories of the island. We visited Santorini for the beautiful views and the resorts and were not disappointed. The people were charming and welcoming. The airport however is a disgrace and after viewing all the charm the island offers my last impression is of an airport that is dirty garbage strewn terrible washrooms poor decorations terrible TV sound and choice of what's on TV one food provider only with terribly high concession prices. 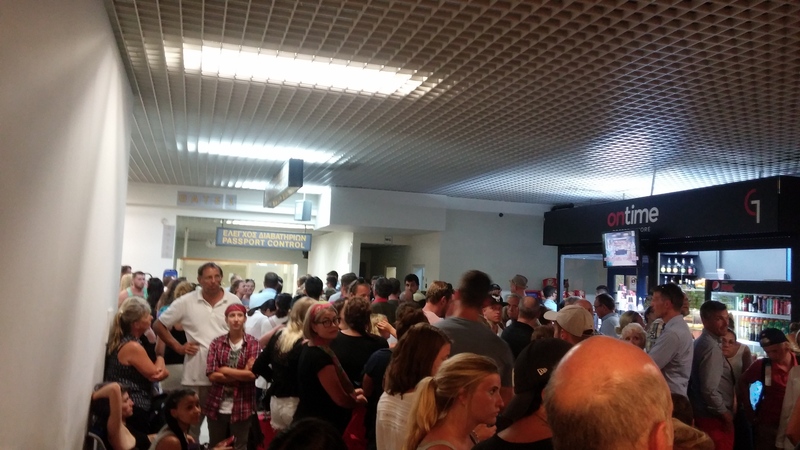 Used this airport in July to fly Olympic to Athens. It is simply fantastic with an open roof garden looking to the runway and Aegean. Clean toilets and limited shops.